B2B marketers: Stop selling and start being useful! Traditionally B2B marketing has been viewed as fundamentally different to B2C marketing with different strategies, methods and implementation. Nowhere is this clearer than in a recent report from Salesforce where the top 5 areas for increased spending for B2C and B2B marketers show a completely different focus. Those 5 areas - as seen below - seem to indicate that the main focus for B2B (with the honourable exception of content marketing) is on sales and advertising. This seems rather old school and doesn’t take account of the modern trend away from interruption marketing. It’s a sales-led approach that results in lead generation but that does not necessarily follow-through to sales and long term customer relationships. If we look back historically, before the days of the Internet, a company’s main sales tool was the humble sales rep, physically visiting clients and getting to know them personally. A good sales rep would find out their client’s needs, their struggles, their likes and dislikes. Buyers would develop a rapport with the sales rep, come to trust them and would even value their advice. This human-to-human contact created loyalty and long-term, valuable relationships, enabling companies to sell and sell again to the same customer. Today B2B marketers seem to want to distance themselves from that intimate contact and just generate volume – quantity over quality. Part of the problem is that many sales/marketing departments are now judged on acquisition – the number of new sales leads they can generate and not on the number of happy satisfied customers or long term revenue. As marketers, we should all know that it is more expensive to find a new customer than to sell to an existing one, and yet many companies concentrate very little effort on keeping existing customers happy and selling to them. Savvy marketers talk about Customer Lifetime Value – the net profit attributed to the entire future relationship with a customer, rather than the instant profit of an immediate sale. And, of course, this only works if you retain the customer and have a decent product or service. (If your product or service is poor, then you best go for new customers every time – good luck with that!). The key to this long-term customer relationship is trust, service and communication. And by working towards this more permission-based B2B marketing, your approach starts to look a lot less different from B2C marketing. Trust is built on reputation – so demonstrating thought leadership through content marketing is a clear objective of your B2B efforts. Whilst content marketing can help you get found by new customers and help convert them through calls to action, it is also excellent for supporting existing customers. Providing information, useful tips, and helpful guides can all come from content marketing and help to cement the relationship with the existing customer – and yes, it also has the beneficial side effect of impressing the soon-to-be customer that you not only know what you are talking about, but that you will be supportive should they buy from you. Social media clearly has an important role to play in supporting – and selling to – existing customers. Whether it be LinkedIn, Facebook, Google+, Twitter or Pinterest, they can all be used to provide information on the latest product or service, help and guidance, differentiate products, respond to customer questions and provide personal support. 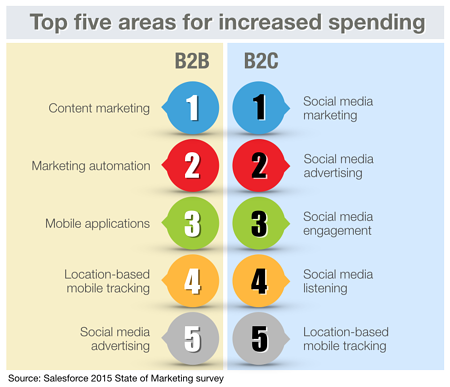 A priority for 2015 should be to incorporate a lot more emphasis on social media as part of your B2B marketing mix. So, what are the rewards for companies who take this personal relationship approach and look at developing existing customers? All this indicates that nurturing the long-term relationship with the existing customer is a key factor in increasing revenue, efficiency and ROI. But even new customers are people too. When do you ever sell a B2B product or service to a business? You never do, you sell it to a person, an individual human being. So all marketing, B2C and B2B, to existing or new customers should be based on a personal approach, on engagement, on building trust, on responsive support and on a strong human-to-human relationship. Now is the time for B2B marketers to stop selling and start listening, providing useful content, engaging and responding.